Most forex trades are anonymous, unremarkable transactions, of interest only to the trader involved and possibly the broker. Hardly surprising, given that the Forex market has the highest trading volume of any capital market by some distance. Yet, over the years, there have been a few high-profile trades that have really captured the public imagination and changed the face of currency trading forever. Here, we’re going to shine the spotlight on three of the most notable forex trades of all time, the circumstances that provided these gilt-edged opportunities, and their political impact. The trader behind the most famous forex trade of all time, George Soros, was born George Schwartz in Budapest, Hungary in 1930. After surviving the 1945 Battle of Budapest, in which German and Russian forces clashed in the city streets, he moved to England and changed his name to the less Germanic-sounding Soros in 1947. After starting out as a shop attendant in seaside souvenir shops, he got himself a job at a London merchant bank before moving to New York to work as an arbitrage trader on Wall Street in 1956. Although he aspired to become a writer and philospher – dreams which he would later realise with the publication of several best-selling books expounding his economic philosophies – his undoubted trading acumen saw his reputation in the financial services industry soar, and in 1970 he formed his own company, Soros Fund Management, the firm behind the legendary Quantum hedge fund. After German reunification in the early 1990s, Soros formed the opinion that the British pound was hugely overvalued in comparison to the German mark. He was not alone in this viewpoint, with several other investors making bets against the pound. However, none of them took up such a massive position as Soros, who put together a massive $10 billion short trade against the value of the pound. Then, when Britain was forced to pull out of the European Exchange Rate Mechanism in 1992, the value of the pound fell dramatically as Soros had predicted, leaving him with a cool $1 billion profit. As a consequence, Soros became known as ‘the Man Who Broke the Bank of England’, and his position as a leading economic thinker was cemented. 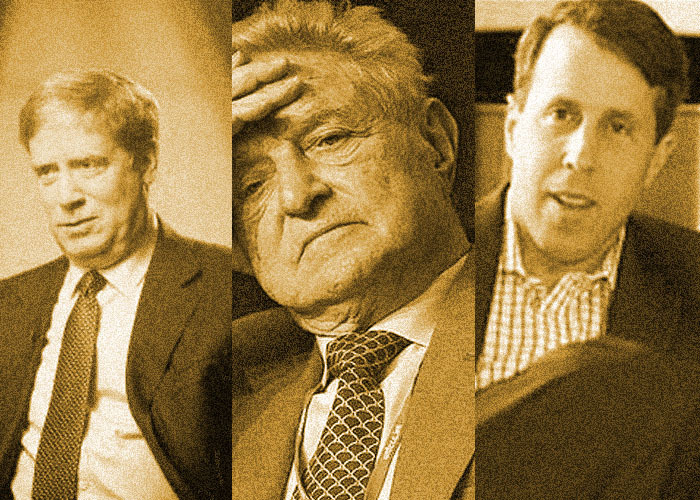 While George Soros is largely given the credit for spotting the weakness in the pound ahead of Black Wednesday, it is widely reported that it was in fact one of his money managers at Soros Fund Management, Stanley Druckenmiller, who originally identified the opportunity. Druckenmiller was born in Pittsburgh, Pennsylvania, and quit a Ph.D. programme in economics to work as an oil analyst at Pittsburgh National Bank in 1977. At the age of 28, he formed his own firm in 1981 called Duquesne Capital Management before going to work for George Soros in 1988. Having been in Berlin when the wall came down, Druckenmiller was bullish on the German mark despite the predicted difficulties involved in the re-unification process. Flying in the face of the prevailing trend, Druckenmiller bet that the currency would rebound in value and entered a large long position on the German mark, making millions for Soros Fund Management when the mark surged in value as he predicted. Then, a couple of years later when Soros was launching his campaign against the British pound, Druckenmiller went long on the mark on the presumption that its value would rise if the pound fell. At the same time, he predicted that a heavily devalued British pound would boost UK businesses by making its exports a lot cheaper, and bought lots of stocks in British firms. When the pound tanked, these two plays paid off handsomely for Druckenmiller, and despite being overshadowed by his boss’ even bigger win around the same event, it is still considered to be the second greatest forex trade of all time. Before Soros and Druckenmiller set a new high water-mark for forex trades, the most high-profile forex trade of all time involved a currency trader called Andy Krieger and the relatively obscure USD/NZD pairing (aka the Kiwi). After the Dow Jones Industrial Average fell 22% on October 19th, 1987, traders were scrambling around to sell off their US dollars. At the age of just 32, Krieger recognised that the big sell-off would lead to the overvaluation of other currencies, and decided to short the New Zealand dollar in a big way. So big, in fact, that it was rumoured that the amount of sell orders against the kiwi was greater than the entire money supply of New Zealand. This caused the kiwi to fall by a massive (in forex terms) 5%, allowing Krieger to make millions from his arbitrage. Although these trades did make huge sums for the traders, they did not actually damage the national economies involved. In fact, it could be argued that by exploiting a fundamental weakness in a currency, these aggressive trades forced the likes of New Zealand and Great Britain to value their currencies more realistically, which actually helped to boost their economies.